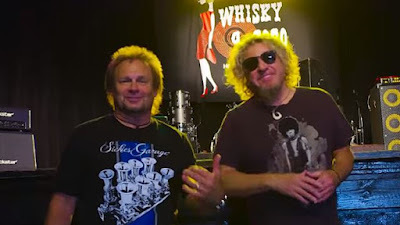 Sammy Hagar and Michael Anthony can be seen sharing memories of the Sunset Strip in behind the scenes footage from Hagar’s new AXS-TV series Rock & Roll Road Trip. The pair teamed up at the Whisky A Go Go – where Van Halen were once the house band in the 70s – to talk about the club’s legendary history. Hagar’s 6 episode AXS-TV series sees the Red Rocker drive across the country to jam with some of music's biggest names, including Tommy Lee of Motley Crue, Bob Weir and Mickey Hart of the Grateful Dead, Heart’s Ann and Nancy Wilson, Alice Cooper and Alice In Chains guitarist Jerry Cantrell.